The author's dog Rocky modeling the scarf. 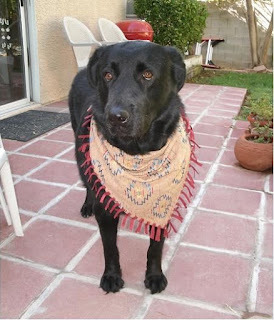 In Death by Association, A DIY Diva Mystery, Bear knows he’s a handsome boy when he wears the reversible, two-tone, fringed scarf that Laurel made for him. Bear’s scarf features a Western print on one side and solid brick red on the other side. The decorative fringe on his scarf is brick red, too. Note: This project requires sewing two straight stitches on a sewing machine. Beginning sewers can easily make this cute scarf for their favorite furry friend. 2. Fold the square of paper diagonally and hold it in place around your dog’s neck to check the size. Adjust the size, if necessary. Cut the square diagonally to make the scarf pattern. Add ½ inch to the diagonal edge for a seam allowance. 3. Place the two pieces of suede cloth right rides together and lay flat. Place the pattern on top of the suede cloth. Use pins, tape, or weight with soup cans to hold the pattern in place while you cut through both layers of fabric to cut out the pieces. 4. Remove the pattern and pin the diagonal edges of the suede cloth, right sides together. Stitch a ½-inch seam. Understitch, turn, and press. Pin unstitched edges to keep them from shifting. 5. For the fringe, cut several 1/8-inch by 5-inch strips of suede cloth. Use all one color for the fringe or alternate both colors. To attach the fringe, start with the bottom point (opposite the stitched seam) and carefully make a ¼-inch slit through both layers of suede cloth ¼ inch from the edge. Laurel uses a seam ripper (very carefully!) to make the slits. 6. Fold a fringe strip in half, wrong sides together. Poke the folded edge through the slits in the fabrics to form a loop. Thread both ends of the fringe strip through the loop and pull them to form a knot to tie it to the edge. Don’t pull the knot so tight that the edge curls. 7. Repeat every ½ inch along the scarf edges, stopping to leave the ends that will be tied together around your dog’s neck without fringe. (On Bear’s large scarf, the fringe stops 7 inches from the ends of the ties.) The ends may be stitched together with a straight stitch ¼ inch from the edge, or they can be left open, whichever you prefer. Tie the scarf around your dog’s neck for doggie dress-up. Don’t forget to have your dog pose for a quick pic so you can show the world what a cute furry friend you have.